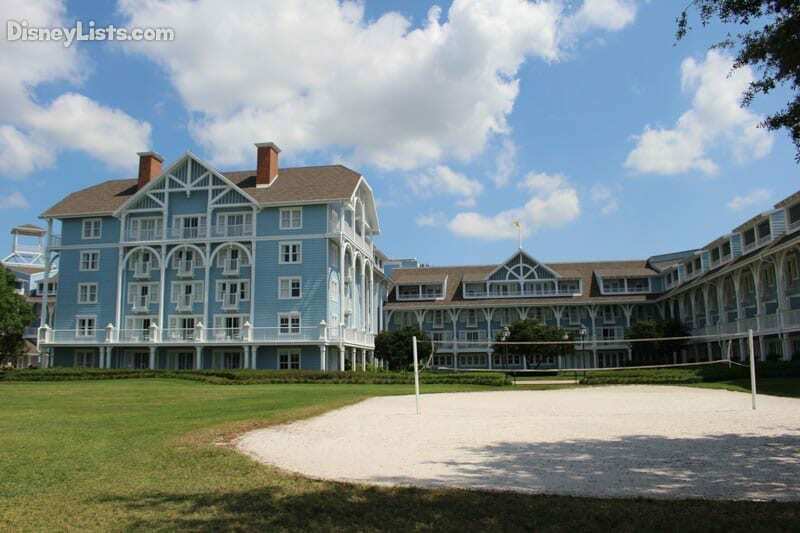 Walt Disney World classifies Disney’s Beach Club Resort as a Deluxe Resort Hotel, so it offers a lot more than the typical Moderate or Value Resort Hotel. This equates to more options, amenities, and activities than you probably realize when it’s time to choose. You want to make sure the resort you select meets your family’s vacation needs and desires. Consider these nine things you should know about this deluxe resort before making the reservation. The Beach Club’s décor pays homage to the many resorts that reside along the New England shoreline. The resort’s pastel blue color with white trim suggests the tranquil waters of a coastal inlet, especially at night when the lights reflect off the pool water and buildings. The spacious lobby features elegant sitting areas where the whole family can relax while checking in. The rooms extend the theme with beach art and elegant furnishings. In fact, the beach concept plays so well in every space at this resort that you may wonder if you’ve been transported to someplace in Connecticut or Massachusetts. Of course, the sight of palm trees brings you right back to Florida. Situated in the Epcot Resort Area, the Beach Club Resort grants its guests access to many restaurants, attractions, and activities. It sits close to the International Gateway entrance to Epcot, providing visitors quick access to the theme park without requiring a car, ferryboat, bus, or monorail. It isn’t far from Disney’s BoardWalk and Hollywood Studios, either. Also, you can easily walk to the launching site for the Albatross Treasure Cruise and the pontoon specialty cruise to view IllumiNations: Reflections of Earth. If your party values being in the middle of the action, then the Beach Club Resort certainly delivers. Although you’ll find many fine restaurants nearby, this resort offers great dining for all the family. Those seeking character dining meals should consider Cape May Café, which hosts the popular Minnie’s Beach Bash Breakfast. 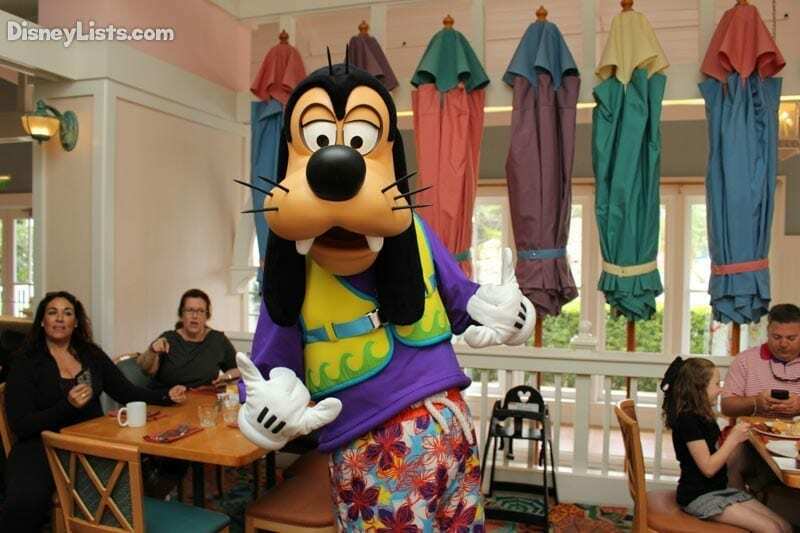 The restaurant serves an extensive breakfast buffet while Minnie and her friends move from table to table to meet guests. Of course, you can also come for their seafood buffet at dinnertime and enjoy a spread that includes shrimp, clams, mussels, and fish, as well as chicken and beef, but you won’t see Minnie and the gang. Beaches & Cream Soda Shop serves American favorites like burgers, grilled cheese, and hot dogs in a classic 1950s ice cream shop setting. Of course, the best part of Beaches & Cream must be the milkshakes and sundaes, especially the huge Kitchen Sink that’s meant to serve four. Try not to get a brain freeze. The Beach Club Resort also provides quick-service meals at its Beach Club Marketplace whenever you’re in a rush and just want a quick bite. 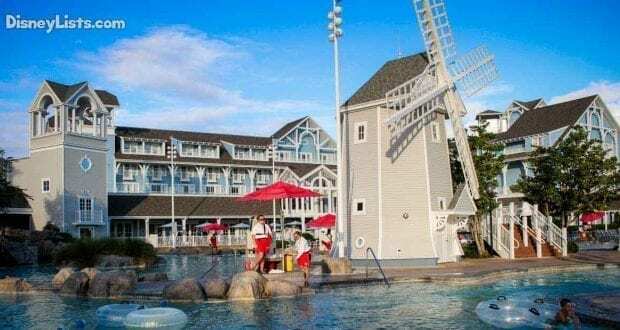 Disney’s Beach Club Resort offers free bus transportation to all theme parks and attractions throughout Walt Disney World. However, Epcot, Disney’s Hollywood Studios, and Disney’s BoardWalk can be reached by ferryboat, which cuts down your wait time significantly. Also, those with park hopper tickets who want to avoid bus transportation to Magic Kingdom may opt to walk through Epcot and catch the monorail on the other side. This last option may be preferable during peak season when buses filled quickly. Bayside Marina provides opportunities for guests who love getting out on the water. Try renting a motorized boat for a cruise around Crescent Lake or sign up for a fishing trip. Disney’s professional anglers would love to take you out on a two or four hour bass fishing excursion. Don’t worry about bringing any gear, because they provide rod and reel, bait, and tackle. Also, your children may want to experience the pirate-themed Albatross Treasure Cruise that sails them around Crescent Lake and Epcot’s World Showcase Lagoon in search of treasure. You can book a nighttime cruise aboard a pontoon that takes you just inside World Showcase Lagoon to get a stunning view of IlluniNations: Reflections of Earth. Naturally, you’ll want to spend loads of time with your kids in the theme parks. However, while staying at Walt Disney World for an extended period of time, children may lose energy and parents may yearn for a break. The Beach Club Resort offers a great alternative for families looking to mix things up with Sandcastle Club. Children from 3 to 12 years of age can engage in fun activities in the evening that include creating volcanoes, receiving cooking lessons, or training to become a buccaneer while parents sneak off to enjoy adult time. Don’t worry about dinner; the staff at Sandcastle Club will serve your children their own delicious meal. Ready to feel the burn? If so, then you’ll love Ship Shape Massage Salon Fitness. Whether you want a cardio workout on state-of-the-art treadmill and bicycle machines or you’re looking to pump iron using weight machines or free weights, Ship Shape provides what you need around the clock. But this health club offers more than just fitness equipment for its guests. It features spa services with Swedish and firm-pressure massages and citrus facials designed to relax your muscles and rejuvenate your skin. Also, you can enjoy their nail and salon services to obtain the look you want before you go out for a night on the town. While some like to hurry from one theme park to another, others enjoy taking it easy from time to time. 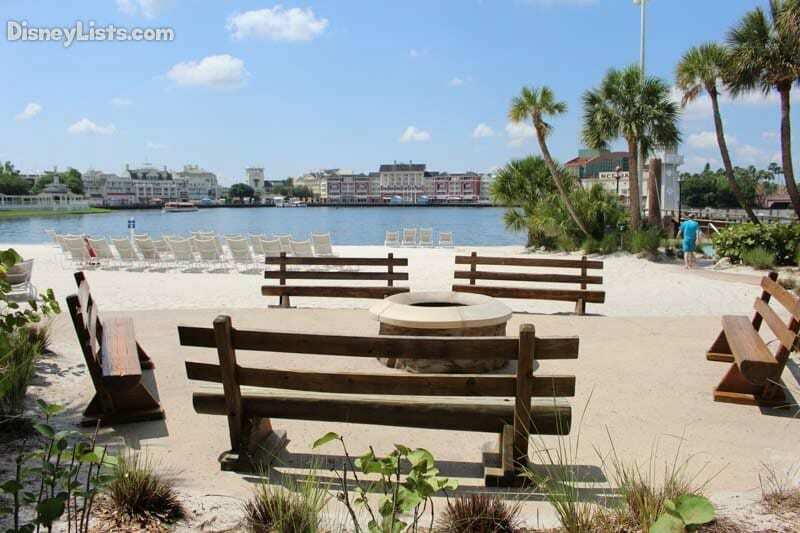 Crescent Lake Beach offers a space to wind down and relax on a beach chair. It’s the perfect place to lay out and tan, read a book, or just stick your feet into the sand and listen to the sounds of the waterfront. On some evenings, resort cast members light up a beach campfire for a time of singing songs, sharing stories, and munching on s’mores. Stick around afterwards to watch a Disney movie right on the beach. This 3-acre water recreational area continues to be one of the best you’ll find at a Walt Disney World resort. It features a shipwreck replica with a 230-foot slide that dumps you into a large, sprawling pool with plenty of space to play. On the other side of Stormalong Bay, you’ll discover a sloping entrance to a sandy-bottom pool with shallow, kid-friendly areas for little ones to play. A sandbank provides a place where children may create sand artwork or build sandcastles. In addition, the pool complex features a lazy river and three whirlpool spas for your relaxation and enjoyment. Nearby, Hurricane Hanna’s Waterside Bar and Grill serves burgers, sandwiches, and more for swimmers who have worked up an appetite and drinks to age-appropriate adults who just want to relax. Guests looking for a quieter poolside experience may visit the smaller Tidal Pool or Dunes Cove Pool, located in low-traffic areas, because Stormalong Bay will be hopping all day long.